EAF Inc. custom designs and fabricates Gaging/Gauge Stations and customized products for flexible manufacturing cells. liding doors for ease of access to gage components. 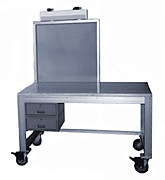 Designed for Industrial Work Environment for On-Sight Checking at Point-of-Use.